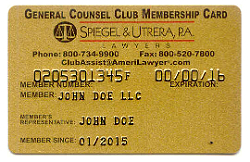 General Counsel Club - Unlimited Legal Assistance - Amerilawyer.com - Spiegel & Utrera, P. A. If you are AN EXISTING MEMBER and would like to just ORDER ADDITIONAL CARDS for your officers, members, beneficiaries, trustees and employees, please complete our Additional Cards General Counsel Club order form. If you are AN EXISTING MEMBER and would like to RENEW YOUR MEMBERSHIP, please visit our GCC Renewal Order Form. Advertise for 1 year on the Client Bulletin Board on our website. Sign me up for one term only. One term with Auto Pay - please renew me automatically each year by credit card. Would you like to order additional cards for your officers, members, beneficiaries, trustees and employees? If you have a company at this time, please provide the name and state of corporation. PayPal Payment Instructions: If you are going to process your order with a PayPal account, provide us with the email address associated with your account. No charges are ever processed or requested until we speak with you first. The total amount reflects the cost of a 1 year membership to Spiegel & Utrera, P.A. 's General Counsel Club for each card ordered. Type the word in the image below to validate. We have taken the necessary measures to guarantee that any client information submitted to our secure server will not be intercepted by unauthorized parties. Without you having to download any additional software, your information is automatically protected with a 128 bit encryption certificate. Double click on the Gold Padlock on the bottom right of your browser's screen to bring up details of our SSL Security certificate.